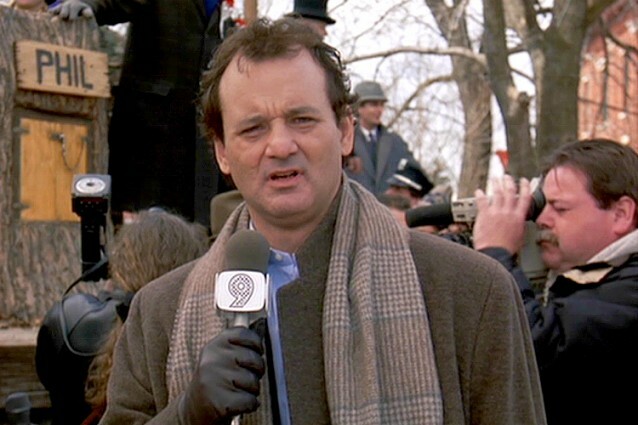 I love Groundhog Day, mostly because it gives me an excuse to pull out my DVD of the classic Bill Murray movie. I’ve watched it dozens and dozens of times over the years, which of course feels like watching it hundreds and hundreds of times. That’s because the main character in the movie, a weatherman named Phil, ends up reliving the same day, February 2nd, over and over and over again. Aside from the comedy of the show, it is interesting to see the character development of Phil as he comes to grips with his new temporal situation. At first Phil wallows in, what he perceives to be, the misery of being eternally stuck in the small, quaint town of Punxsutawny, Pennsylvania. Initially Phil decides to indulge in some of his more base desires for food, alcohol, cigarettes and a series of one night stands. It’s not long before he realizes that these things are not going to cut it. Next he graduates to more dangerous pursuits like robbing armored trucks and driving a car on the railroad tracks toward an oncoming train or off a cliff. Eventually Phil realizes that none of these things are going to bring him the contentment and joy he’s seeking. It’s at this point that our stranded weatherman brings viewing each day as an opportunity to not only better himself, but improve the lives of those around him. By the end of the show, Phil has learned to play the piano and his weather report has evolved from shallow and sarcastic to poetic and eloquent. He fixes Felix’s back and ice sculpts masterpieces. He catches a boy falling out of a tree and changes a flat tire on a senior citizen’s car. He’s in the right place at the right time to give a choking man the Heimlich and convince a bride with cold feet to go through with her wedding. I couldn’t help but see the similarities between Phil’s experience and how life tends to unfold for the rest of us. Often we start out by looking to all the activities in which we find pleasure. We try to fill our lives up with enough of these things in hopes that somehow entertainment will actually produce lasting joy. It doesn’t take us long to figure out that the thrill and pleasure provided by these activities, although not inherently bad, is ultimately short lived. Perhaps from there we take some time to indulge in our base desires of greed, lust and ego, but the inescapable consequences of such actions soon catch up with us.